“You know what …… this rink wouldn’t be bad for ice hockey”. Late November 1981 and the very faintest seed had been sewn but it was a seed that was to grow to be the mightiest of oaks. Just ten years later, Peterborough ice hockey was appearing live in front of millions on BBC Grandstand as the Pirates contested the British Championship Finals at Wembley Arena with, ultimately, only the mighty Durham Wasps stopping Peterborough from claiming to host the best ice hockey team in the UK. Peterborough was never supposed to have an ice-rink. The builders, Huntingdon based Anglia Leisure Ltd, wanted to build on a made to measure site on the outskirts of Cambridge but repeated delays in the planning process proved to be Cambridge’s loss and Peterborough’s gain and the builders moved fast to modify an existing warehouse in Bretton to give them the ice facility they sought and at a knockdown price of just £1.75M. The rink was the first to be opened in the UK since the early 1960s and the rink owners moved quickly to staff it up ready for the various uses they had already foreseen. Four professional instructors were employed to give lessons in ice-dance and figure-skating and there was already an indoor speed skating club established and ready to go before the doors had even opened. Indeed there was a heavy speed skating bias throughout the new rink with the Assistant Manager being the reigning Fenland speed skating champion and the rink engineer being an established international skater. The rink had already identified ice-hockey as a sport they would host “if there is enough local interest” and contacts at Nottingham’s rink had already offered to come along and help start the ball (puck ?) rolling but it was the rink engineer, John Webster, who actually started the process moving. John was working at the ice-rink in Bradford and was commuting down to the impressive new ice-pad. Ice hockey had already been established since 1977 in Bradford and the Bulldogs were already playing league hockey so John wasted no time in inviting hockey fanatic and Bulldogs founder, Granville Raper, to come down to Peterborough for the opening day speed skating gala and to run his eye over the new rink. “Granny” was impressed and, in the rink bar afterwards, enthusiastically shared his views with John that the Bretton rink would make a great hockey venue ……. a view supported by his colleague. Granny decided to test the waters by putting up a notice at the rink asking for all who were interested in playing ice-hockey to come forward for a Sunday lunch-time session. Among the first to see the notice were the Hunter family, who had recently returned to the UK from Canada and who were already looking at the venue with a hockey-eye as brothers John, Tony and Kevin had started playing the sport in Oshawa, Canada and were keen to continue. The Hunters got in touch with Granny, who was still based in Bradford at the time, and they combined forces in pursuing their common goal. More than twenty people attended that first session, enough to convince all involved that hockey had a future in the rink and a committee was formed to take matters further. That committee consisted of rink manager Noel Hurn, assistant rink manager Paul French, Gordon Forest, John Hunter (snr) and Alan Tilley. The first meeting looked at how to raise much needed funds for equipment (the rink manager offered 50% of the takings from the space invader machines !) 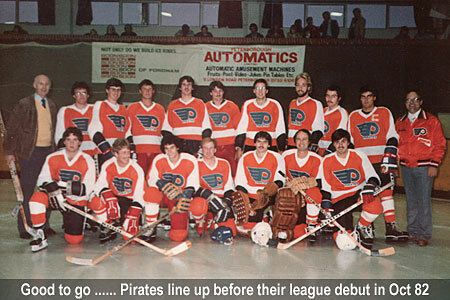 and even pondered over names for a hockey team with favoured suggestions including Penguins, Petes and Pirates ……. the rink manager wanted Penguins but the hockey lobby were adamant that fat wobbly creatures were not the image they were looking for so Pirates it was ! Throughout the first half of 1982, the growing band of hockey enthusiasts met every Sunday lunchtime and initially trained under the guidance of the Hunters, Granny (who moved to Peterborough in February 1982 and lodged with the Hunter family) and St. Neots based John Burke who had played hockey previously with Haringey and Streatham. The enthusiastic training team were soon further boosted by a locally based US Airman, Pete Casimira, who became in effect Pirates first ever overseas player ! 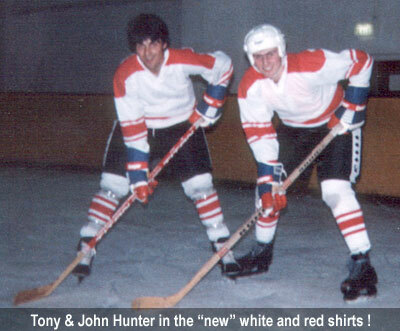 Early players included the three Hunter brothers – John, Kevin and Tony, Sandy MacDonald – a serviceman from RAF Wittering who was a champion skier and had played for the Aviemore Blackhawks five years earlier and the Cade brothers – Barry and Ian, who had been playing for the city’s Roller Hockey side but were keen to transfer their skills to ice ……. Barry had even sold his precious scuba diving gear to buy his £250 worth of hockey kit that each of the players had agreed to purchase ! Facilities for ice hockey at the East of England rink were very limited in those early days. There were no lines on the ice and there were no nets around it either. An early problem was the draining of funds to cover the cost of replacing the cafeteria windows that were being broken by stray pucks on a regular basis ! Early sessions saw the hockey fledglings using plastic traffic cones as goalposts but eventually they came into posession of proper hockey goals courtesy of the Cambridge University ice-hockey team who were also using the building for training. Thankfully, the rink soon recognised the wisdom of keeping pucks in the arena and installed netting to protect the cafeteria. Further accommodating moves included the fitting of doors to the surrounding rink boards so that players could enter the ice without having to climb over them and the painting of hockey lines which the players happily worked throughout one Sunday night to complete ! The hockey boys were given a boost when the rink announced that it would be holding a big public gala event in May to showcase the various ice based activities. 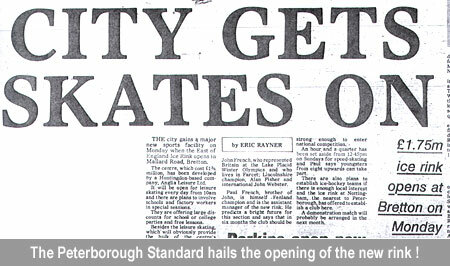 Hockey had been given a slot and, although it wouldn’t be long enough for a regulation game, it was still an opportunity to introduce the sport to Peterborough sports fans. John Burke got in touch with his old Streatham club and they agreed to send up their second string side, the Bruins. 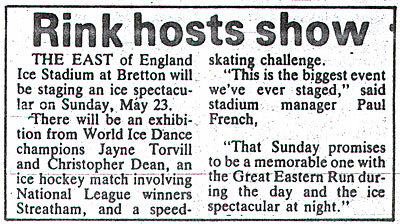 The Gala Event was held on 23rd May 1982 in front of 600 spectators and the stars of the show were ice dancers Torvill and Dean who were just about reaching the peak of their popularity and were debuting their famous Barnum routine at the event. The hockey boys were a little less well equipped for the big stage and had to borrow a spare set of red shirts from their opponants for what turned out to be a non-regulation 45 minute scrimmage that the Streatham boys won 9-1 but at least they scored a goal ……. courtesy of Tony Hunter ! Feedback from the hockey debut was very mixed, some loved it, some didn’t and perhaps the decision to strip down to basics at the end of the game in a re-enactment of a scene from the cult hockey movie Slapshot was a little too much for an audience primarily there to witness the ultimate family safe entertainment that was Torvill and Dean. Certainly the Peterborough Standard (later renamed Herald & Post) reporter was less than taken by his first sight of the Pirates, pronouncing “Then followed an exhibition ice hockey match between Peterborough Pirates and Streatham Mohawks. It went on too long and what would have been fun as a taster became tedious.” It was a good job they didn’t play a regulation three period game ! Undeterred by the mixed reaction, it was full steam ahead for the hockey boys who immediately fixed up a “proper” game for the following month when Nottingham’s second string, the Trojans, would visit for the Pirates first regulation three period game. The team’s management also set about getting the Pirates into the National League setup for the 1982/83 season and received confirmation that they would start off in Division Three, the same division that their next opponents finished third in during the past season. The team certainly needed shirts now so Granny and the Hunter boys headed off to the Surfside & Alpine Sports shop in Nottingham, one of the few outlets who offered hockey equipment in the UK at that time and bought the team a full set of shirts …….. white with a red trim. However, no sooner had the shirts made it back to base than news broke that the team had its first official sponsors, Anglia Tyre Services, for whom John Burke was an employee. The problem there was that red and white didn’t cut it with Anglia Tyre Services (ATS) who had corporate colours of orange so the new shirts were rendered redundant as a team uniform pretty much from the start ! The team decided that, given the combination of the orange ATS shirts and the team name, they would take inspiration from the NHL’s famous “orange” team, the Philadelphia Flyers, and use a modified version of their “Flying P” logo as the team logo to adourn the front of their shirts ……. and so the famous orange “Flying P” Pirates shirt was born. 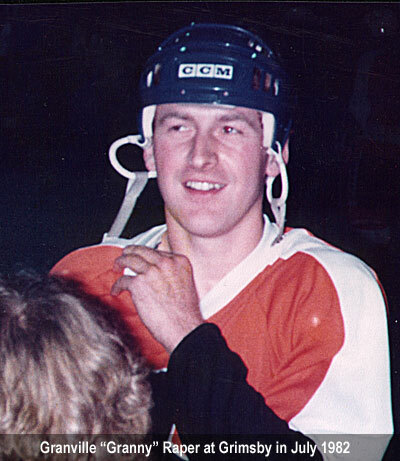 Incidentally, John Burke actually spoke to Philadelphia Flyers who not only gave the thumbs up to use thir logo but were real chuffed that we were doing so ! The new shirts debuted on 26th June 1982 as League Division Three side Nottingham Trojans came to town and, in front of around 400 paying fans, Pirates won their first full game 7-3 (3-1, 2-0, 2-2). Goalscorers were Tony Hunter (2), Roger Mawditt, Kevin Hunter, Sandy MacDonald, Barry Cade and Pekka Hakkarainen …… one of two Finnish brothers that Pirates had borrowed from the Cambridge University side ! Also in the side were Sean Mun Liang from Cambridge University and guest English international winger Phil Adams from Streatham. Unlike with last month’s Ice Gala, this event was declared a great success with an excited rink manager Paul French declaring, “we expected a crowd of about 50 and that Pirates would lose about 12-0 ! Half the players in our side couldn’t even skate properly until this rink was opened six months ago, yet they beat an established English League side quite easily. It’s a fantastic start and to get 400 people here without advertising the match is way beyond expectation. At present we can only seat 600 – judging by the response tonight we will exceed that number once the season begins in September so plans are already in the pipeline to increase the seating. I believe this sport can take off here in a big way !”. Throughout the latter part of the summer, Pirates played further challenge games against the likes of Sheffield, Grimsby, Solihull, Billingham and Altrincham. Many of these teams were from higher divisions than Pirates would be playing in but, despite losing four of the five games, the team equipped themselves well and the ambitious Pirates committee decided to lobby hard to move the team’s starting position for the season ahead from Division Three to Division Two …… with the help of a few “old friends” they succeeded ! To succeed in the higher division, the club knew they would need a couple of overseas players to boost their ranks and that would need financing. A search for sponsorship led them to the Hereward Video Library and owners Eddie and Peggy Porter. Not being particularly into sport, Eddie wasn’t too keen but Peggy was more interested and after increasingly frantic encouragement from the club they decided to sign up as Pirates sponsors for the season ahead. The financial backing allowed Pirates to secure the services of two overseas players. The two were initially destined for Nottingham Panthers but confusion between two Panthers scouts ended up with four players flying over to the UK and the club were struggling to finance all four of them so Pirates saw their chance and jumped in. Nobody knew what to expect but the arrival of forward John Lawless and D-man Rob Carnegie was to transform the growth of ice hockey in the city. Both players combined to take over coaching duties at the club as well as to provide “leadership on the ice” which was not a bad return for the rumoured £25 a week they were each being paid ! After a jet-lagged debut up in Altrincham, the two players galvanised and spearheaded their new team to victory in their opening league fixture against old foes Streatham Bruins at Bretton who they beat 12-4 (6-1, 3-1, 3-2) on the 3rd October 1982 after racing into a 4-0 lead inside ten minutes. Both Lawless and Carnegie bagged three goals each with Solihull based Glenn Skidmore also bagging a hat-trick. Ironically Granny Raper, who had done so much to get ice hockey in Peterborough to this point, missed all but the opening minutes of the game after taking a huge hit and spending the rest of the evening in hospital with concussion ! By season’s end, hockey was well and truly established in Peterborough with crowds swelling to in excess of 1,000. The diminutive Lawless had become a city superstar and very nearly delivered a first season championship for his side, being pipped only by head-to-head records against champions and, by now, bitter rivals Solihull Barons.